My name is Karen Bebnowski and I am the Director of Program Development and Marketing for Families First of Florida, LLC. The New Year provides opportunities for reflection, especially for me. I have been able to a foster and adopt children in ‘the system’; as well as be raised by my own parents who also fostered and adopted children. I can say there is great value and reward in both raising and being raised with foster children. 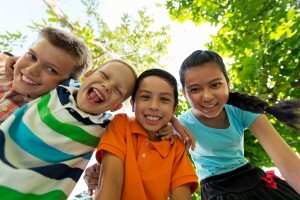 These children bring a unique and different perspective to your family and home and you can learn and grow from them being a part of your family. Rituals and practices that were passed down from their families can, and do, become a part of your own, as your traditions become a part of theirs. Fostering can be challenging, especially a child with unique behavioral/mental health needs, just as raising your own children can be challenging. Challenges and sacrifices that need to be made for a foster child, are also made for our biological children. They may be different sacrifices and challenges, but one is not greater or a harder than the other. The first therapeutic foster child I brought into my home came to me with mangled hair, dirty clothes and cowboy boots that were too big. She seemed unsure and frightened, but asked to call me Mom right away. Recognizing this as a need to belong, to “fit in”, I became Mom. I remember her first birthday celebration with us and how, I could tell she never had that celebration before. Sitting in front of a cake as big as she was and listening to us sing happy birthday excited her. She was really surprised when she got to open presents and I could tell she never had the chance to open one before that day. I was committed to making sure she got to open presents every birthday after that day. We need more Foster Parents in the state of Florida. There is a significant shortage of homes in the Tampa Bay Area causing children to reside in group homes, siblings to be separated, or, for children with unique needs to not have those needs met because the right homes aren’t available. Here’s a video showing our Foster Parent Open House and how to join us next year! Families First of Florida, LLC has been providing therapeutic foster care since 2000 and we are committed to meeting the need in the Tampa Bay Area. We have a passion for our foster parents and the youth we serve and work diligently to supply them with all the tools necessary to be successful in life. Please consider becoming a foster parent or a mentor to one of our youth.